We describe a previously unreported braincase of the sauropod dinosaur Apatosaurus from the Cactus Park Quarry, Morrison Formation of western Colorado using high-resolution X-ray computed tomography. The digital nature of these data allowed us to prepare and describe the first three- dimensional rendering of the endocranial space in this historically important dinosaur species. Results are compared with a range of taxa drawn from across the sauropod tree revealing previously underappreciated variation in the sauropod neurocranium. Examples of variable characters include the nature of cerebral and pontine flexure, morphology of the parietal body and superior sagittal sinus, division of the metotic fenestra, and the morphology of several cranial nerve foramina. We provide preliminary evolutionary hypotheses and discussion for many of these features. Hopefully, the recognition that phylogenetically informative variation is present will encourage more detailed descriptions of this anatomically complex region, as well as facilitating a synthetic review of the sauropodomorph braincase as these descriptions become available. This specimen was collected from the Jurassic Morrison Formation of the Cactus Park BYU Quarry in western Colorado. It was made available to the University of Texas High-Resolution X-ray CT Facility for scanning by Dr. Gabe Bever of the American Museum of Natural History. Funding for scanning was provided by Dr. Bever. This specimen was scanned by Richard Ketcham on 14 May 2004 along the coronal axis for a total of 127 slices. Each 1024 x 1024 pixel slice is 1.0 mm thick, with an interslice spacing of 0.8 mm (for a slice overlap of 0.2 mm) and a field of reconstruction of 265 mm. Alonso, P. D., A. C. Milner, R. A. Ketcham, M. J. Cookson, and T. B. Rowe. 2004. The avian nature of the brain and inner ear of Archaeopteryx. Nature 430: 666–669. Baumel, J. J., and L. M. Witmer. 1993. Osteologia. In J. J. Baumel, A.S. King, J. E. Breazile, H. E. Evans, and J. C. Vanden Berge (editors), Handbook of Avian Anatomy: Nomina Anatomica Avium, 2nd ed., Publications of the Nuttall Ornithological Club, no. 23: 45–132. Cambridge: Nuttall Ornithological Club. Bellairs, A. d’A., and A. M. Kamal. 1981. The chondrocranium and the development of the skull in recent reptiles. In C. Gans, and T. S. Parsons (editors), Biology of the Reptilia, Vol. 11, Morphology F: 1–263. London: Academic Press. Benton, M. J., L. Juul., G. W. Storrs, and P. M. Galton. 2000. Anatomy and systematics of the prosauropod dinosaur Thecodontosaurus antiquus from the Upper Triassic of southwest England. Journal of Vertebrate Paleontology 20: 77-108. Berman, D. S., and J. S. McIntosh. 1978. Skull and relationships of the Upper Jurassic sauropod Apatosaurus (Reptilia, Saurischia). Bulletin of Carnegie Museum of Natural History 8: 1–35. Berman, D. S., and S. L. Jain. 1982. The braincase of a small sauropod dinosaur (Reptilia: Saurischia) from the Upper Cretaceous Lameta Group, Central India, with review of Lameta Group localities. Annals of Carnegie Museum 51: 405–422. Bever, G. S, C. J. Bell, and J. A. Maisano. 2005. The ossified braincase and cephalic osteoderms of Shinisaurus crocodilurus (Squamata, Shinisauridae). Palaeontologia Electronica 8:1–36. Brochu, C. A. 2000. A digitally rendered endocast for Tyrannosaurus rex. Journal of Vertebrate Paleontology 20: 1–6. Butler, A. B., and W. Hodos. 1996. Comparative Vertebrate Neuroanatomy. New York: Wiley-Liss & Sons, Inc., 514 pp. Calvo, J. O., and L. Salgado. 1995. Rebbachisaurus tessonei sp. nov. A new Sauropoda from Albian– Cenomanian of Argentina; new evidence on the origin of the Diplodocidae. GAIA 11: 13–33. Carlson, W. D., T. Rowe, R. A. Ketcham, and M. W. Colbert. 2003. Geological applications of high-resolution X-ray computed tomography in petrology, meteoritics and paleontology. In F. Mees, R. Swennen, M. Van Geet, and P. Jacobs (editors), Applications of X-ray Computed Tomography in the Geosciences 215: 7–22. London: Geological Society. Chatterjee, S., and Z. Zheng. 2002. Cranial anatomy of Shunosaurus, a basal sauropod dinosaur from the Middle Jurassic of China. Zoological Journal of the Linnean Society 136: 145–169. Chatterjee, S. and Z. Zheng. 2005. Neuroanatomy and dentition of Camarasaurus lentus. In V. Tidwell and K. Carpenter (editors), Thunder-Lizards: The Sauropodomorph Dinosaurs: 199–211. Bloomington: Indiana University Press. Chen, C. J. 2001. Suprasellar and infrasellar craniopharyngioma with a persistent craniopharyngeal canal: case report and review of the literature. Neuroradiology 43: 760–762. Clark, J. M., J. Welman, J. A. Gauthier, J. M. Parrish. 1993. The laterosphenoid of early archosauriforms. Journal of Vertebrate Paleontology 13: 48–57. Connely, M. V., and R. Hawley. 1998. A proposed reconstruction of the jaw musculature and other soft cranial tissues of Apatosaurus. Journal of Vertebrate Paleontology 18(supplement to 3): 35A. Currie, P. J. 1997. Braincase anatomy. In P. J. Currie and K. Padian (editors), Encyclopedia of Dinosaurs: 81– 85. San Diego: Academic Press. Curtice, B. D., and D. R. Wilhite. 1996. A re-evaluation of the Dry Mesa Dinosaur Quarry sauropod fauna with a description of juvenile sauropod elements. In A. C. Huffman, Jr., W. R. Lund, and L. H. Godwin (editors), Geology and Resources of the Paradox Basin. Utah Geological Association Guidebook 25: 325–338. Salt Lake City: Utah Geological Association. Edinger, T. 1942. The pituitary body in giant animals fossil and living: a survey and a suggestion. Quarterly Review of Biology 17: 31–45. Edinger, T. 1955. The size of the parietal foramen and organ in reptiles. Bulletin of the Museum of Comparative Zoology, Harvard College 114: 3–34. Foster, J. R. 2003. Paleoecological analysis of the vertebrate fauna of the Morrison Formation (Upper Jurassic), Rocky Mountain Region, U.S.A. Bulletin of New Mexico Museum of Natural History 23: 1–95. Franzosa, J. W. 2004. Evolution of the brain in Theropoda (Dinosauria). Ph.D. diss. The University of Texas at Austin, 357pp. Galton, P. M. 1985. Cranial anatomy of the prosauropod dinosaur Plateosaurus from the Knollenmergel (Middle Keuper, Upper Triassic) of Germany. Geologica et Palaeontologica 19: 119–159. Galton, P. M. 2001 Endocranial casts of the plated dinosaur Stegosaurus (Upper Jurassic, western USA): a complete undistorted cast and the original specimens of Othniel Charles Marsh. In K. Carpenter (editor), The Armored Dinosaurs: 103–129. Bloomington: Indiana University Press. Galton, P. M., and P. Upchurch. 2004. Stegosauria. In D.B. Weishampel, P. Dodson, and H. Osmólska (editors), The Dinosauria, 2nd ed. : 343–362. Berkeley: University of California Press. Goodrich, E. S. 1930 (1986 reprint). Studies on the Structure and Development of Vertebrates. Chicago: University of Chicago Press, 837pp. Gower, D. J. 2002. Braincase evolution in suchian archosaurs (Reptilia: Diapsida): evidence from the rauisuchian Batrachotomus kupferzellensis. Zoological Journal of the Linnean Society 136:49-76. Gower, D. J., and E. Weber. 1998. The braincase of Euparkeria, and the evolutionary relationships of birds and crocodilians. Biological Reviews 73:367-411. Harris, J. D. 2006. Cranial osteology of Suuwassea emilieae (Sauropoda: Diplodocoidea: Flagellicaudata) from the upper Jurassic Morrrison Formation of Montana, USA. Journal of Vertebrate Paleontology 26: 88– 102. Harris, J. D., and P. Dodson. 2004. A new diplodocoid sauropod dinosaur from the upper Jurassic Morrison Formation of Montana, USA. Acta Palaeontologica Polonica 49: 197–210. Hauser, G., and G. F. De Stefano. 1989. Epigenetic Variants of the Human Skull. Stuttgart: Schweizerbart, 301pp. Holland, W. J. 1906. The osteology of Diplodocus Marsh. Memoirs of the Carnegie Museum 2: 225–278. Hopson, J. A. 1979. Paleoneurology. In C. Gans, R. G. Northcutt, and P. Ulinski (editors), Biology of the Reptilia, Vol. 9: 39–146. London: Academic Press. Janensch, W. 1935–36. Die Schädel der Sauropoden Brachiosaurus, Barosaurus und Dicraeosaurus aus den Tendaguru-Schichten Deutsch-Ostafrikas. Sonder-Abdruck aus Palaeontographica Beiträge zur Naturgeschichte der Vorzeit herausgegeben von F. Broili in München, suppl. 7, vol. 2: 147–297, 13 plates. Larsson, H. C. E., P. C. Sereno, and J. A. Wilson. 2000. Forebrain enlargement among nonavian theropod dinosaurs. Journal of Vertebrate Paleontology 20: 615–618. Madsen, J., J. S. McIntosh, and D. S. Berman. 1995. Skull and atlas-axis complex of the upper Jurassic sauropod Camarasaurus Cope (Reptilia:Saurischia). Bulletin Carnegie Museum of Natural History 31: 1– 115. Marsh, O. C. 1877. New order of extinct Reptilia (Stegosauria) from the Jurassic of the Rocky Mountains. American Journal of Science, Third Series 14: 513–514. Marsh, O. C. 1880. Principal characters of American Jurassic dinosaurs, part III. American Journal of Science, Third Series 19: 253–259. Marsh, O. C. 1884. Principle characters of American Jurassic dinosaurs. Part VII. On the Diplodocidae, a new family of the Sauropoda. American Journal of Science, Third Series 27: 161–167. Marsh, O. C. 1896. The dinosaurs of North America. Annual Report of the U. S. Geological Survey 16: 133– 244. Osborn, H. F., and C.C. Mook. 1921. Camarasaurus, Amphicoelias, and other sauropods of Cope. Memoirs of the American Museum of Natural History, New Series 3: 247–287. Ostrom, J. H., and J. S. McIntosh. 1966 (1999 reprint). Marsh’s Dinosaurs: The Collections from Como Bluff. New Haven: Yale University Press, 388 pp. Quay, W. B. 1979. The parietal eye-pineal complex. In C. Gans, R. G. Northcutt, and P. Ulinski (editors), Biology of the Reptilia, Vol. 9, Neurology: 245–406. London: Academic Press. Raath, M. A. 1972. Fossil vertebrate studies in Rhodesia: a new dinosaur (Reptilia: Saurischia) from near the Triassic-Jurassic boundary. Arnoldia 5: 1–37. Rauhut, O. W. M., K. Remes, R. Fechner, G. Cladera, and P. Puerta. 2005. Discovery of a short-necked sauropod dinosaur from the Late Jurassic period of Patagonia. Nature 435: 670–672. Remes, K. 2006. Revision of the Tendaguru sauropod dinosaur Tornieria africana (Fraas) and its relevance for sauropod paleobiogeography. Journal of Vertebrate Paleonontology 26: 651–669. Rieppel, O. 1985. The recessus scalae tympani and its bearing on the classification of reptiles. Journal of Herpetology 19: 373–384. Rogers, S. W. 1998. Exploring dinosaur neuropaleobiology: computed tomography scanning and analysis of an Allosaurus fragilis endocast. Neuron 21: 673–679. Rogers, S. W. 1999. Allosaurus, crocodiles, and birds: evolutionary clues from spiral computed tomography of an endocast. Anatomical Record Part B 257: 162–173. Romer, A. S. 1956. Osteology of the Reptiles. Chicago: University of Chicago Press, 772 pp. Roth, J. J., and E. C. Roth. 1980. The parietal-pineal complex among paleovertebrates: evidence for temperature regulation. In R. D. K. Thomas, and E. C. Olsen (editors), A Cold Look at the Warm- Blooded Dinosaurs: 189–250. Boulder: Westview Press. Salgado, L. 1999. The macroevolution of the Diplodocimorpha (Dinosauria; Sauropoda): a developmental model. Ameghiniana 36: 203–216. Salgado, L., and J. O. Calvo. 1992. Cranial osteology of Amargosaurus cazaui Salgado & Bonaparte (Sauropoda, Dicraeosauridae) from the Neocomian of Patagonia. Ameghiniana 29: 337–346. Sereno, P. C., J. A. Wilson, L. M. Witmer, J. A. White, A. Maga, O. Ide, and T. Rowe. 2007. Structural extremes in a Cretaceous dinosaur. Proceedings of the Library of Science ONE 2:e1230. Tidwell, V., and K. Carpenter. 2003. Braincase of an early Cretaceous titanosauriform sauropod from Texas. Journal of Vertebrate Paleontology 23: 176–180. Upchurch, P. 1998. The phylogenetic relationships of sauropod dinosaurs. Zoological Journal of the Linnean Society 124: 43–103. Upchurch, P., P. M. Barrett, and P. Dodson. 2004. Sauropoda. In D. B. Weishampel, P. Dodson, and H. Osmólska (editors), The Dinosauria, 2nd ed. : 259–322. Berkeley: University of California Press. White, T. E. 1958. The braincase of Camarasaurus lentus (Marsh). Journal of Paleontology 32: 477–494. Wilson, J. A. 2002. Sauropod dinosaur phylogeny critique and cladistic analysis. Zoological Journal of the Linnean Society 136: 217–276. Wilson, J. A. 2005. Redescription of the Mongolian sauropod Nemegtosaurus mongoliensis Nowinski (Dinosauria: Saurischia) and comments on Late Cretaceous sauropod diversity. Journal of Systematic Palaeontology 3: 283–318. Wilson, J. A., M. S. Malkani, and P. D. Gingerich. 2005. 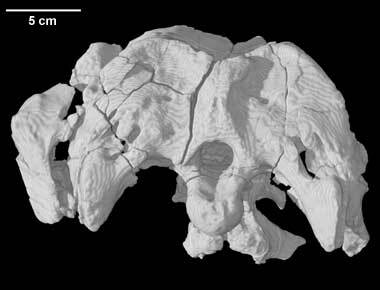 A sauropod braincase from the Pab Formation (Upper Cretaceous, Maastrichtian) of Balochistan, Pakistan. Gondwana Geological Magazine 8: 101–109. Witmer, L. M., R. C. Ridgely, S. D. Sampson. 2004. The ear region, cerebral endocast, and cephalic sinuses of the abelisaurid theropod dinosaur Majungatholus. Journal of Vertebrate Paleontology 24 (supplement to 3): 131A. Zheng, Z. 1991. Morphology of the braincase of Shunosaurus. Vertebrata Palasiatica 29: 108–118. Click on the thumbnail to the left for a pitch rotation animation (3.1 mb) of the Apatosaurus endocast. Click on the thumbnail to the left for a pitch rotation animation (1.4 mb) of the Apatosaurus endocast rendered inside the semi-transparent braincase. Click on the thumbnail to the left for a yaw rotation animation (3.8 mb) of the Apatosaurus endocast. Click on the thumbnail to the left for a yaw rotation animation (2.4 mb) of the Apatosaurus endocast rendered inside the semi-transparent braincase. Click on the thumbnail to the left for a roll rotation animation (3.5 mb) of the Apatosaurus endocast. To cite this page: Dr. Amy Balanoff, Gabe S. Bever and Takehito Ikejiri, 2010, "Apatosaurus sp." (On-line), Digital Morphology. Accessed April 25, 2019 at http://digimorph.org/specimens/Apatosaurus_sp/.